Allowing Canadians to grow their own pot will create too many problems for police, some law enforcement representatives say. They're asking the federal government not to allow the practice, at least not yet. Canada's police chiefs are asking the Trudeau government not to let Canadians grow pot at home, arguing that policing the practice would put a much greater demand on law enforcement. The request from the Canadian Association of Chiefs of Police was one of several recommendations the group is making in response to the Liberal government's Task Force on Cannabis Legalization and Regulation report. The task force drafted its report to help guide the Trudeau government as it prepares to table legislation this spring legalizing weed for personal use. In that report it was recommended that personal cultivation should be permitted, but with a limit on four plants per home, and a height restriction of 100 centimetres to reduce fire risks. But the police association is asking officials to "hold off on home grows," saying that if Canadians have their own pot plants it would run counter to the government's objective of a highly regulated and controlled system of legalization. It's a subject where the government is getting conflicting advice. The association argues that permitting homegrown cannabis will create too much work for law enforcement. Police chiefs said it would be a struggle to ensure sure Canadians don't grow too much, or try to sell some of their crop on the black market. The chiefs also said it would be difficult to keep children and youth away from cannabis and that home grow-ops in general come with the risk of causing electrical problems and fire hazards that would put first responders at risk. 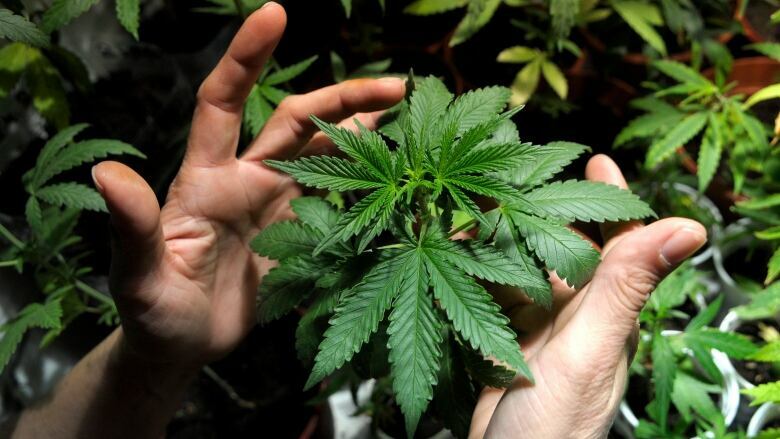 The task force noted that "few topics of discussion generated stronger views" than the issue of whether people should be allowed to grow pot for personal use. However, the task force also said that 92 per cent of those who responded to the online consultation about legalizing and regulating cannabis supported personal cultivation. What's more, the final report notes that law enforcement has acknowledged "the practical difficulties of trying to enforce a complete ban on cultivation for personal use." The task force said that measures could be put in place to mitigate the risks associated with homegrown pot, such as lockable spaces for indoor production and ensuring plants grown outside aren't visible from the street or nearby homes. The government isn't bound to follow the task force's advice, and it's unknown what course the government will take with its legislation. Bill Blair, a former Toronto police chief, and now the parliamentary secretary for justice as well as the Liberal's point-man on the pot legalization file, has indicated he doesn't see marijuana as a benign substance. "Unlike tomatoes, it is a substance that poses certain significant … social and health harms, and risks to Canadians," he said in June. The Canadian Association of Chiefs of Police made several other recommendations for the government. In the discussion paper released today, it flags the challenges around drug-impaired driving, noting that the limits are "not defined and supported by science." The paper suggests that could lead to legal challenges. Federal officials are working with some police forces on a pilot project that has already begun to test the saliva samples of some drivers to see how well certain roadside tests work. The association said that without a science-based measure of impairment, it "strongly recommends" that the government increase investment in "drug recognition experts" and officer training to help detect and stop impaired drivers. The government should "start now" on education and awareness campaigns, the report advises. Overall, the association's advice to the government on legalizing marijuana is to "begin with caution" in order to give officials and regulators time to adjust.